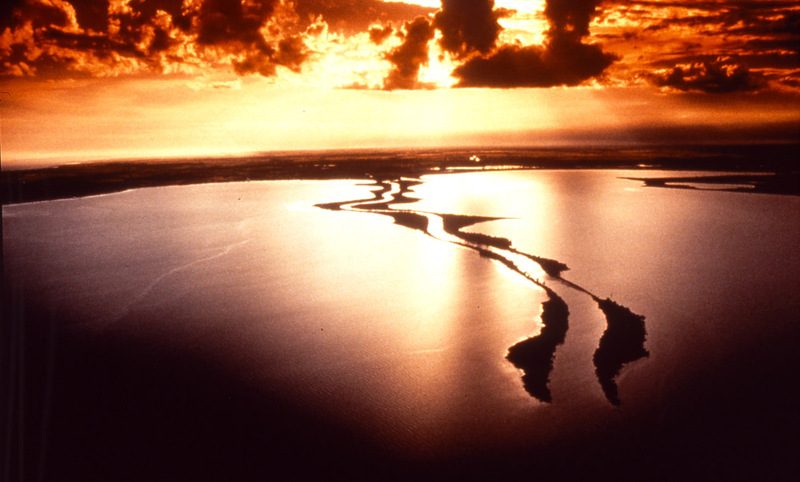 The Gippsland Lakes are made up of a series of shallow coastal lagoons separated from the sea by broad sandy barriers. They include Lake Wellington (138 square kilometres) Lake Victoria (110 square kilometres), Lake King (92 square kilometres) and a number of smaller lagoons and wetlands. Five main rivers drain into the Lakes: the Latrobe and the Avon flow into Lake Wellington, the Mitchell, Nicholson, and Tambo into Lake King. The total catchment is more than 20,000 square kilometres. The Lakes are generally shallow; much of Lake Wellington is less than 4m and much of Lake King less than 6m. Lake Victoria occupies a long narrow furrow up to 10 m deep. The deepest point in the Gippsland Lakes is approximately 15m near Shaving Point, Metung. The Lakes catchment includes a large diversity of land types each with its own plant community. There has also been a variety of man-made changes to the vegetation. The main factors that determine where vegetation grows are rainfall, temperature and soil fertility. Within the catchment: Vegetation ranges from relatively natural native forests, woodlands, heaths and grasslands, through to highly modified and managed vegetation such as pastures, crops and pine plantations. 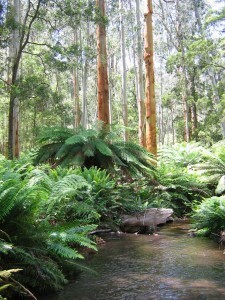 Forests and woodlands: Forests and woodlands within the Gippsland Lakes catchment vary considerably with elevation. Snow-gum woodland is found in the sub-alpine areas. Moving down the forest changes to stands of alpine ash, then mountain ash and mixed eucalypt forest. On the coastal plain there are still areas of open grassy Red-gum woodland. Scrub and grasslands: Along the coastal beaches tussock grasses persist, giving way to coastal tea-tree scrub on more sheltered sites. There are also areas of banksia woodland and swamp paperbark. Around Lake margins: Fringing wetlands around the Gippsland Lakes include areas of freshwater and brackish wetlands as well as areas of saltmarsh. These areas are vegetated with a wide range of plants. Within the Lakes: Within the Lakes there are areas of seagrass, important for fish breeding. As well there are open lagoons that tend to have a presence of algae. They may be quite saline, such as parts of Lake King, or brackish like Lake Wellington. Of international significance, the Mitchell delta and its silt jetties is one of the finest examples of this type of landform in the world. The silt jetties are formed by sediment deposits from the Mitchell River and persist due a lack of tidal currents in Lake King and the presence of a shoreline reeds fringe able to trap a large proportion of the river sediment whilst protecting the deposits from wave erosion. Changes in vegetation over recent decades have resulted in erosion.